Get a bird's eye view of the cobbled streets of the Left Bank, the Napoleonic splendor of the Ecole Militaire and of course the structure that they thought wouldn't last more than a few years - the Eiffel Tower! 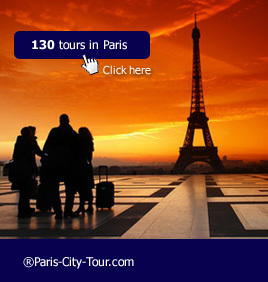 Take time out to explore the Paris you've been looking for; historical, romantic, fashionable, fun and shopper friendly. You can hop on and off as many times as you like aboard this open-top double-decker bus. Get a bird's eye view of the cobbled streets of the Left Bank and the Napoleonic splendor of the Ecole Militaire. See the Eiffel Tower, Paris' most famous landmark. Stop off at the Arc de Triomphe and walk down the stylish Champs-Elysees. Become acquainted with some of the world's most famous artworks at the Louvre including the mysterious Mona Lisa. Should you book my pass in advance ? Depending on the season the number of visitors may vary a lot. But Paris is a large and boyant city visited all year long by 60 millions people... As a consequence you may have to queue a long time if you book at the last minute. We recommend you to book in advance. 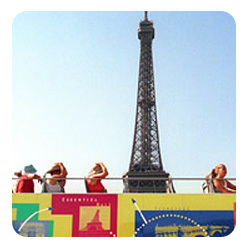 About City Hop-on Hop-off Tour : It is the easiest way to get around town. you can hop-on and hop-off at any of the nine stops as often as you like over a two day period. the Buses depart every 10 - 30 minutes from each stop. Highlights include Madeleine, Opera, Louvre Museum, Notre-Dame, Saint-Germain-des-Pres, Orsay Museum, Concorde, Champs-Elysees, Arc de Triomphe, Eiffel Tower and Invalides.